for me the mind is the "king of all"..
the cup of the senses or the cup of perception still happens within the mind and they are not different cups. if they were different they should be many when they are not. and "many" cannot be established when we cannot find the "one"-the one cup as it were. since we can only negate the ideea of the cup ,the "one" cup cannot be established.and therefore "many" cups has no support-the cup of senses,of perception..and so on. if this ideea of the cup cannot be found does this mean somehow that we have arrived at the point where the mind can see itself? Well yes there really is just one cup, plus various ideas we have about it. Unless.. omg unless the original unseen cup, beyond perception, is multiple. We'd never know if it was! 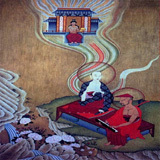 According to Shantideva, mind can't see itself. Apparently you are not your mind and can thus observe it. muni wrote: "There are two kinds of negatives; -affirming ones in which other positive phenomenon is implied in place of the object of negation and non affirming negatives in which no other positive phenomenon is implied in place of the object of negation. Emptiness is the latter." Dalai Lama. Yeshe wrote: As an extreme/ultimate view, phenomena do not exist inherently as they depend completely upon the mind which perceives them. How do we know? Saying they don't inherently exist is just another interpretation. No. The object of negation is not the cup in its entirety. The thing negated is not every last trace of the cup. Then there must be some "part" of it that "exists". Karma Dondrup Tashi wrote: Then there must be some "part" of it that "exists". A part of conceptual fabrication which exist? Or these concrete things like they appear to mind do not really exist. Appearances are dependent arising and emptiness is the understanding that is free from assertions. These two aren't distinct. These two realizations are simultaneous when the view is perfected. As appearance refute extreme of existence and meanwhile emptiness refute extreme of non existence. When we see emptiness arises in form of cause and effect; how can there be extremes as nihilism? Last edited by muni on Mon Feb 22, 2010 7:46 pm, edited 1 time in total. Yup. If there wasn't, you'd have no way of knowing there was a cup at all. When your mind perceives nothing at all, for you nothing exists. It is logically impossible for us to argue that something exists for us without our mind to tell us so. How is it possible then to conclude that there is existence of anything outside what our mind is aware of? Logically, then, everything is dependent upon the mind and has no inherent existence we can otherwise prove. This is why objects and phenomena cannot be negated unless conventionally present to the mind in the first place, either through instinct or perception of form. Their absence (emptiness) can only be shown once the mind thinks that there is a presence, in this case of 'cup'. For example, fear is known to us through instinct as a phenomenon, but a cup is known to us through perception and the mind at a mundane level believing what is perceived to be 'cup'. At that point we can negate or deny its existence as separate from the mind which thinks 'cup'. .....This cup cannot be negated, but remember it is still impermanent. .....that tells me just about nothing about the nature of whatever it is that is causing these perceptions. .....Plus, again they tell us nothing about the cause of all these perceptions. There's a lot to a cup. All of your cups are not different, and have the same source- mind. In your first case, you say you can't see it or otherwise know it, but you still affirm there is a cup.... based on what? All of your cups, in every case, point to the same thing. But you keep saying they tell us nothing about the cause of the perceptions. This is simply because you are focusing too much on the object of perception. If you follow it back, perception is a mental aggregate. It is mind. It's cause is delusion and habitual karma. But as the Heart Sutra tells us, in emptiness "there is no perception". If even perception is false, that mind of the aggregates is false, and subject and object both disappear. So based on what do you still maintain that there is a cup and there is you who perceives it? True dependent origination points to true mind. No matter how real a cup seems, it is only due to our karma. But we shouldn't doubt it's origin. Shurangama Sutra, Chapter 9 wrote: "Ananda, you should know that as a cultivator sits in the Bodhimanda, he is doing away with all thoughts. When his thoughts come to an end, there will be nothing on his mind. This state of pure clarity will stay the same whether in movement or stillness, in remembrance or forgetfulness. When he dwells in this place and enters Samadhi, he is like a person with clear vision who finds himself in total darkness. Although his nature is wonderfully pure, his mind is not yet illuminated. This is the region of the form skandha. If his eyes become clear, he will then experience the ten directions as an open expanse, and the darkness will be gone. This is the end of the form skandha. He will then be able to transcend the turbidity of time. Contemplating the cause of the form skandha, one sees that false thoughts of solidity are its source." Interesting stuff. The only problem I see is that you seem to be saying that if I don't perceive something it doesn't exist, so it should be safe for me to drive with my eyes closed, because that would ensure there is nothing for me to hit. What about that sort of argument? catmoon wrote: Interesting stuff. The only problem I see is that you seem to be saying that if I don't perceive something it doesn't exist, so it should be safe for me to drive with my eyes closed, because that would ensure there is nothing for me to hit. What about that sort of argument? Whether there is perception or not has no meaning toward the existence or non-existence of something which is originally clear space. Still, we are human beings with human karma. Even driving with your eyes open and clearly running into something, that experience is a human being's karma. Whether through eyes, ears, nose, tongue, body or mind, one at a time or all at once together, whether one consciousness works while another doesn't, in all cases it is the mind's work according to our individual karma. Sigh. Maybe I should give up Buddhism and start a button collection. At least I have some idea how to go about collecting buttons. I may be misunderstanding but I think others had a different view. catmoon wrote: Sigh. Maybe I should give up Buddhism and start a button collection. At least I have some idea how to go about collecting buttons. Why not seek out a qualified teacher to help you make sense of the teachings and guide you along progressively? Valid inference. Well said, I was thinking about saying pretty much the same thing. I see rain, therefore the streets are wet. It is this very consistency of reality that makes me think something must be there. Regardless of what I think or perceive, reality goes its merry way with absolute consistency. Sometimes it does so in direct opposition to my beliefs and even my perceptions. My dreams and imaginations notably lack this consistency. In dreams, sometimes the cup DOES turn into the Dalai Lama. Cup is apprehended, mind fabrication. A Bodhisattva understands aggregates are empty, is acting on signs of conventionalities and doesn't have faith in the peaceful state of non-production. Still clinging, the kind of little boss inside must keep control over all, as otherwise there is "nothing"? All is dependent originated = lack on inherent existence. A teacher will guide toward clarity here about, rather than making concept-soup.